If you’re here from Calling it Home, welcome! 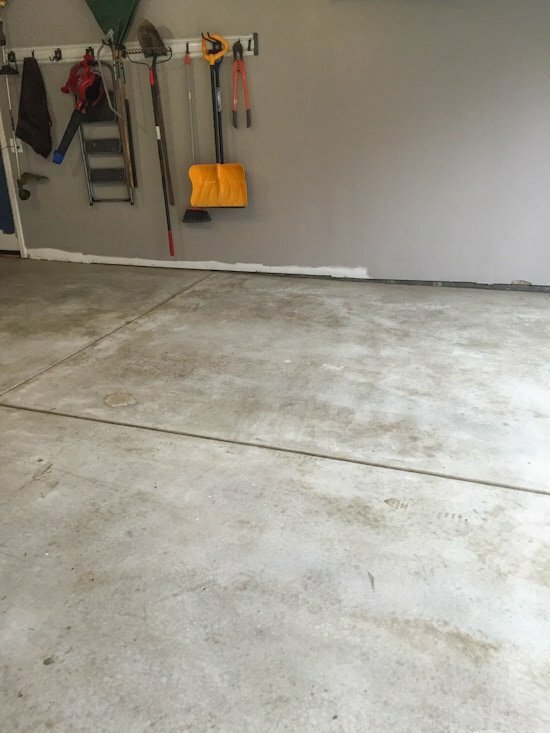 We’re taking on our garage for the One Room Challenge (check out week’s 1, 2, 3 & 4 for all of the details) and are DIYing most of our space. After all of the mess we’ve been dealing with, I’m happy to share that we finally cleared almost everything out and have a blank canvas to re-organize! We cleared out the space this past weekend so we could finally tackle our stained floor. A few hours and a lot of scrubbing later, we were ready for epoxy paint. But, alas, as with all projects with a deadline, of course something went wrong. Womp womp. 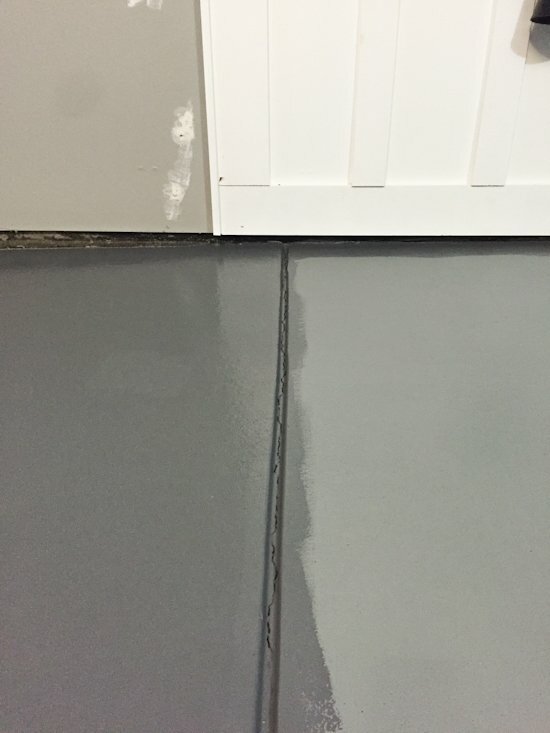 We wanted the floor to be a mid-toned charcoal color, but the first attempt came out much lighter than the swatch. So, back to the store we went (for the 4th time that day, no big deal) to grab a darker color for the 2nd coat. Luckily, all of the running around was worth it, because now we absolutely love it! For some reason the floor is showing up blue in a lot of the pictures, but I promise it’s dark gray! And yes, those are my work boots : P I’m so excited that our big dilemma was fixed so easily, which left time to finish up a few other projects on our list. 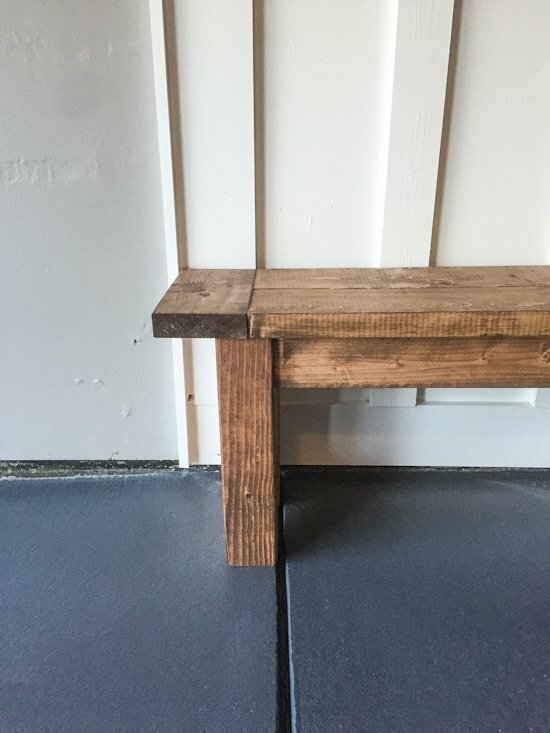 For starters, we added a top to the bench we shared last week and stained it with our new favorite custom stain color- equal parts Special Walnut and Weathered Oak. It’s got a weathered wood look to it that we now want to add all over the house! We also added the frame to the pegboard, stained in the same color, which really helps make the plain ‘ol pegboard look more finished. 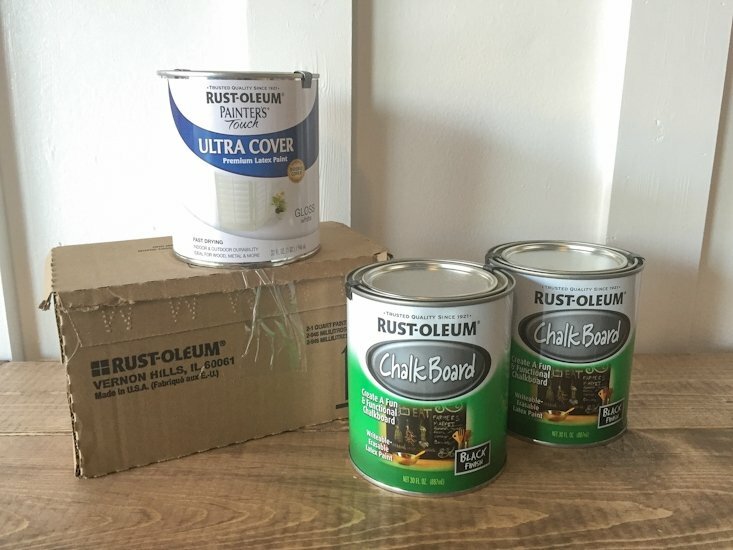 And last but not least, we got a fun delivery from Rustoleum who provided the products to finish up our workbench! 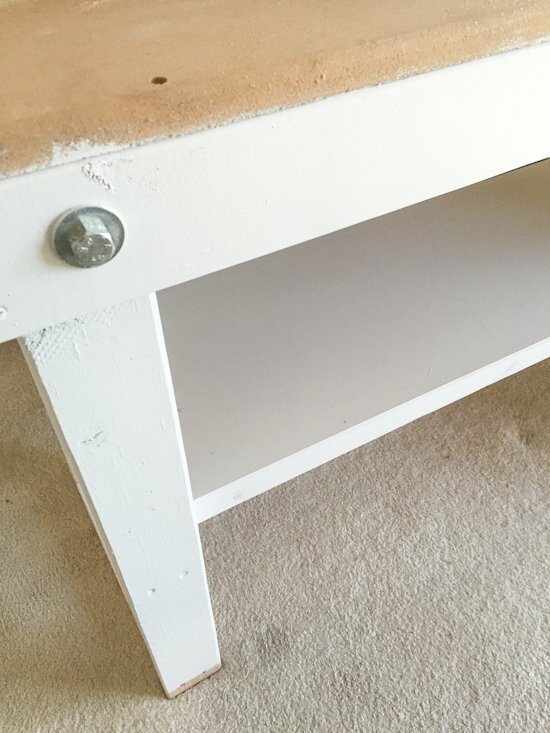 I’ve already started on our fold up workbench, and so far I love how easy and quickly the product goes on. This is the first time using their quart sized paints (I normally grab the spray paints and go to town), and definitely won’t be the last! What’s next? Oh, just about 3 weeks of work that we have to finish this weekend, no biggie. 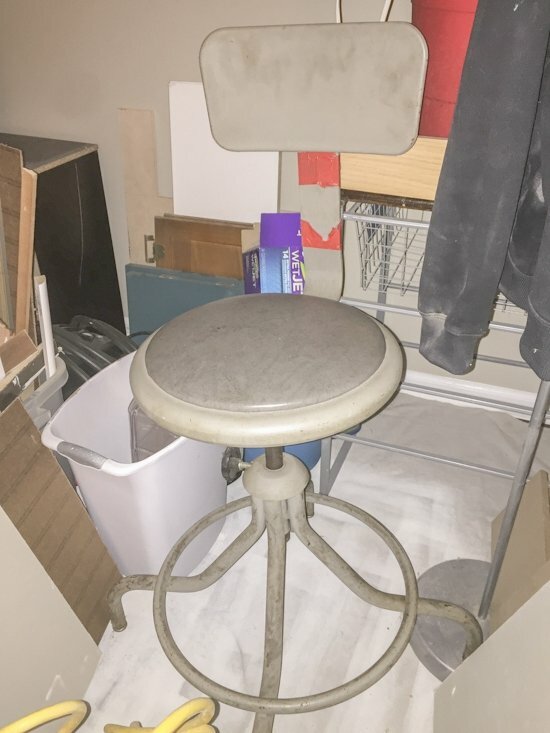 I have also added making over this found chair to our list. Nothing like adding projects at the last minute! Finish installing garage door opener (currently just hanging there since we originally put it up last year. oops) – halfway done! Update lighting – halfway done! We’re in the midst of hanging a new light provided by Parrot Uncle. 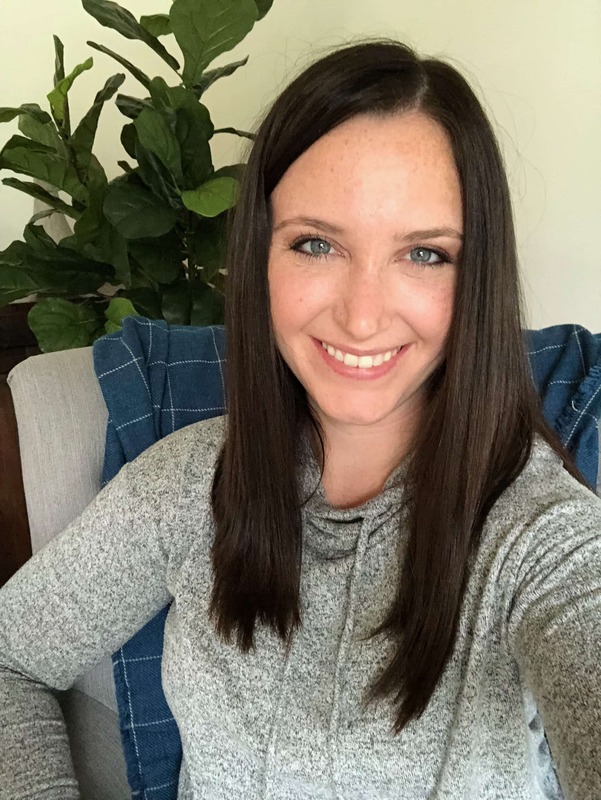 They have some fun options for decorative indoor hanging lights and fashionable pendant light fixtures, so it was easy to find something we liked! Despite everything we have left, I’m still more hopeful than fearful/sweating/shaking in my boots : ) We’ll see you here next week for all of the pretty pictures! It is coming down to the wire. Looks like you have things well in hand. The wood trimmed peg board is such a great idea! Can’t wait to see next week. Wow, the floor looks great! 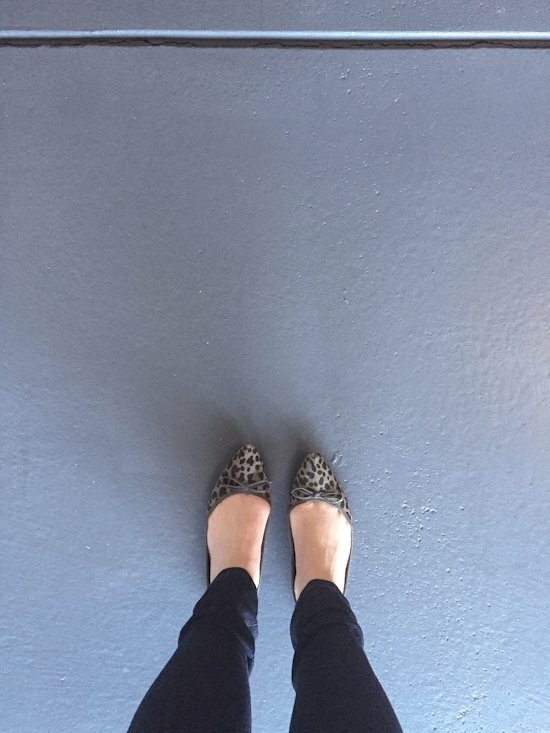 You’re inspiring me…maybe one of these days I will take on our garage floor…the 50+ years of wear on ours was more than I could handle this round, but who knows… Good luck with the final pieces! Can’t wait to see it next week. 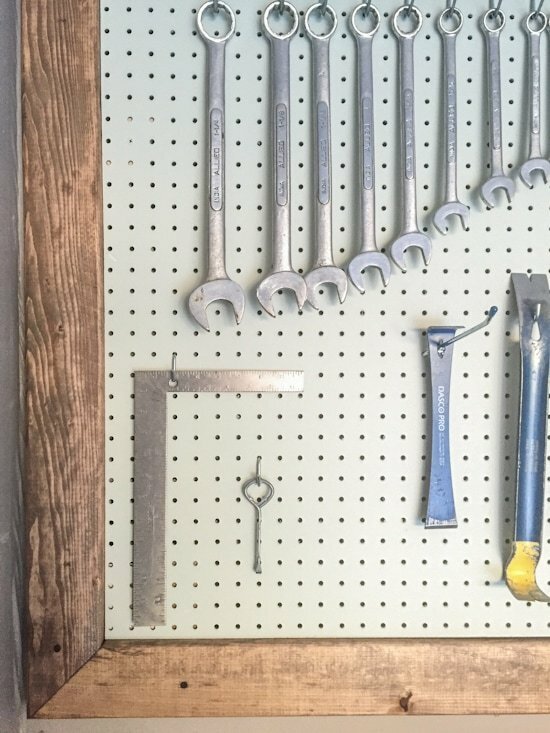 Love the charcoal floor and frame on the pegboard! You guys are going to have such an amazing space to create more projects. And don’t worry, you are not alone with having three weeks of work left!